The guidance package (formerly linguistic resources) delivered with your Acrolinx Server normally includes a terminology database and one or more language configuration files. The language configuration file contains instructions for the server on which term sets to load for the Acrolinx Plug-ins. After you update your terminology and data model, you may wish to make new term sets available to Acrolinx plug-in users. The quickest way to add a term set is in the term set configuration module . However you can also configure a term set directly in the language configuration file. Tip: Regardless of the criteria defined for a term set, the Acrolinx Server only loads terms in the language which is defined in the language configuration file and any terms which have the language value Multiple Languages. Restriction: You cannot use spaces when referencing domains. If your domain name contains a space within the Terminology Manager interface, replace the space with an underscore when referencing the domain in the properties file. For example, if your domain is called 'test terms', add the reference att:test_terms. Tip: The set parameter is an optional setting which enables you to customize the name of the term set. If you do not use this parameter, the server assigns a default name to the term set based on the domain names. If the previous example did not contain the set parameter, the term set name would be planes_trains_automobiles. Attention: If you have entered domain names or term set names which contain non-ASCII characters (such as umlauts or Japanese characters), save the configuration file with the encoding UTF-8 . If the configuration file does not have UTF-encoding, term set names may not display correctly in the Acrolinx plug-in interface. with multiple term sets separated by a semicolon. Tip: The s e t parameter is an optional setting which enables you to customize the name of the term set. If you do not use this parameter, the server uses the name of the filter file as the term set name. Save your changes, restart the core server, then reload the language configuration on the relevant language servers. 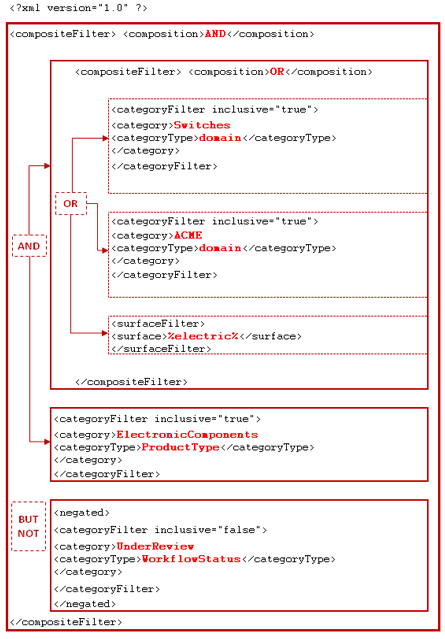 A Filter File is an xml file which can query the terminology database using several different criteria simultaneously. This functionality is very similar in structure to the filters in the Terminology Manager interface. Filter Files are useful for creating term sets which represent different cross-sections of your terminology. 1 compositeFilter Enclose a set of multiple categoryFilter or surfaceFilter criteria. You can use this element several times to nest different sets of criteria. You must use this element within compositeFilter . 1.1.1 negated Exclude a set of criteria from a composite filter. The categoryFilter element has the attribute inclusive which you can set to true or false. Set the inclusive attribute to t r u e to include terms which are associated with subcategories of the specified category value. Set the inclusive attribute to f a l s e to exclude subcategories and filter for terms which only have the exactly the matching category value. 1.1.1.1 category Define the value of the category to filter on. 1.1.1.1.1 categoryType Define the name of the category to filter on. You must use this element within category . 1.1.1. surfaceFilter Enclose a search for terms whose names match a certain pattern. You can also include the element <isCaseSensitive> to ensure the matching takes case into account. 1.1.1.1 surface Define a search pattern to filter on. You must use this element within surfaceFilter. Create a term export filter in the Dashboard. Expand the Term Filter Selection panel, click Filter , and define the criteria for the terms to load. You filter by language so that the language server only loads terms in the relevant language. Enter a file name so that the Save Export Configuration button is enabled, and save the export configuration. Select the export configuration that you saved in when you created the term export filter and click Download . In the window that appears, click the link to open the properties file in a text editor. Find the property exportFilter and copy the filter XML from the value of the property. The following example shows the filter XML for a filter that finds English terms in the domain "Standard_Terminology" with the process status "Finalized". (Optional) Configure your language server to load terms using the filter file .